Thanks bud. I stay up to all hours of the night & that's when I get the best work done, as I'm not pestered by anyone. Yeah Synsol says you can unbind it in the options menu somewhere. If you're unable to find it, send me a private message and I'll link the screen shot. 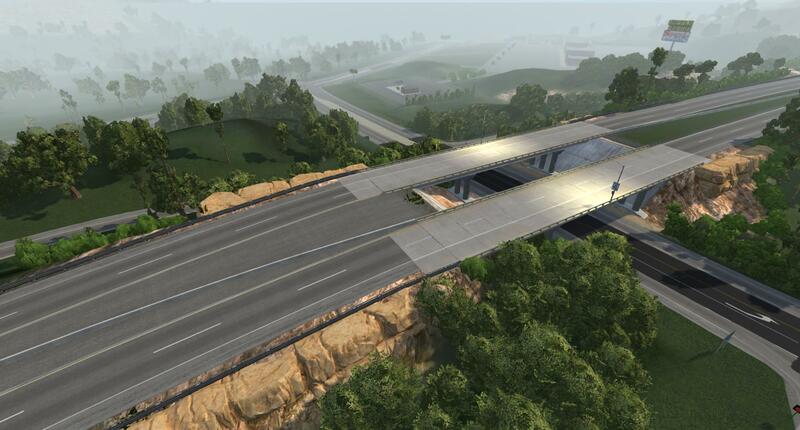 Improved most all the ramps now on the highway. Will make sure most/all of them have improved AI lanes too. Looks 100% seamless on the ground, as it should. Also, replaced a few more bridges today/yesterday. So yes, lots of quality-of-work improvements in improving the fit-and-finish of the map (which isn't that great to begin with, considering the sheer thousands of hours put into it). 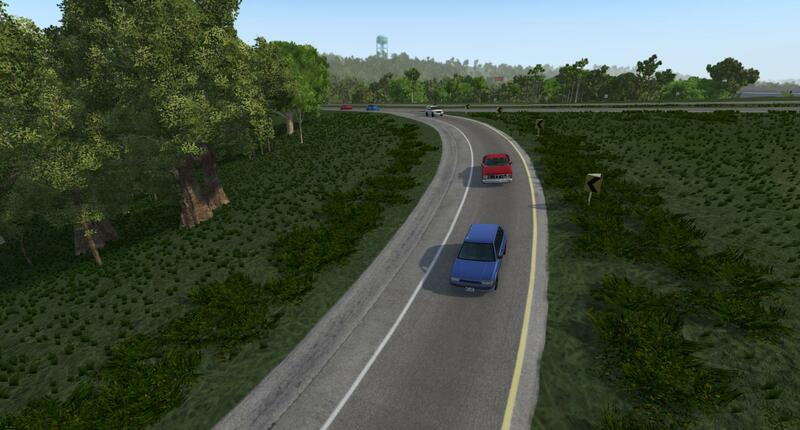 AI lanes north of Harriman on route 27 (Route 27 is the road going under the highway in the last pic above), and AI lanes in downtown Harriman's side-streets to be re-done so the AI doesn't snack on so many stop signs. Bridges by Airport road right at the top of the plateau hill-climb where the US 40 highway goes over on one side and under on the other side, and bridge at Pine Crest rd and Route 40. 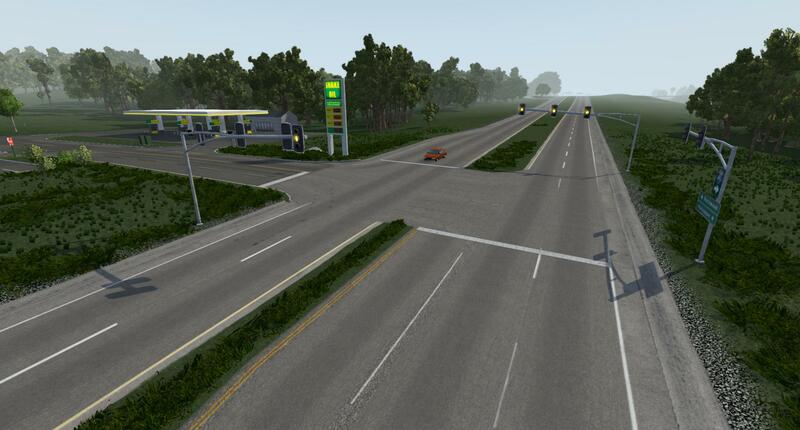 AI lanes on Broadway of America (route that is next to the spend-a-lot spawn) near Pine-Ridge Road where it's four lanes using the highway textures. Make road chunks (visible in last shot) match the new highway textures, because they don't. These pieces make up what the terrain can't always do. Possibly touch-up some of the lane wear-markings so they blend more reliably when they cross over one another. Not mandatory but would help fit-and-finish (visible in last shot). 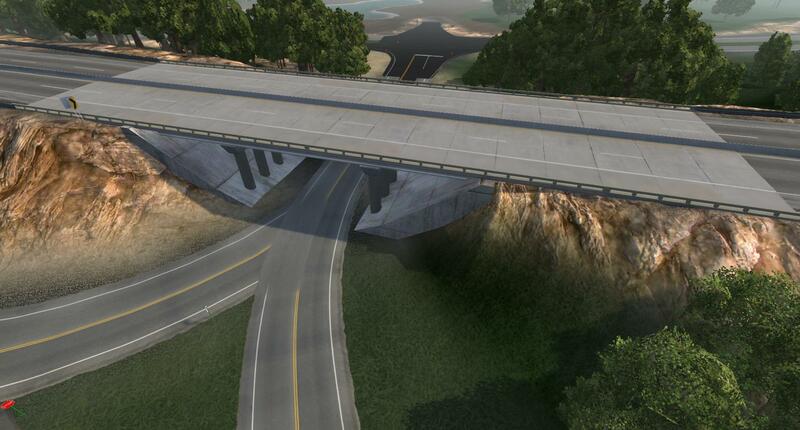 *Edit: Fix sunken road-node north of Harriman by the two bridges where cars appear stuck in the road. Looking like I will be busy until Monday-Tuesday at the latest working on this. Not too much else other than what's listed, but it sure will be a whole-lot-nicer to look at / drive through. 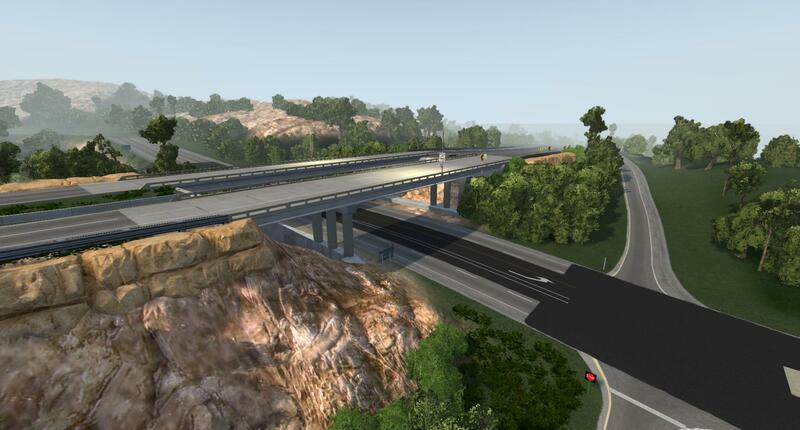 EDIT: Got two more bridges done, and fixed up Pine Ridge Road interchange's terrain just a bit by adding some rock-outcroppings. I tried not to make that turn (past right side of shot on highway) any tighter, it's bad enough*. Also got a bridge just east of here done, too. That bridge above will be very similar to what's going in east of here, that goes over the river (just longer). *Considering this map has been in the works for THREE years now and just in the last 8 months or so I've managed to stop crashing there at-least half of the time now. Might have to address that in a future update sometime. Migraine is really whooping me today (since last night) so might take my eyes off the computer screen for a few hours. Update is still on track to come out publicly this weekend or just past this weekend. 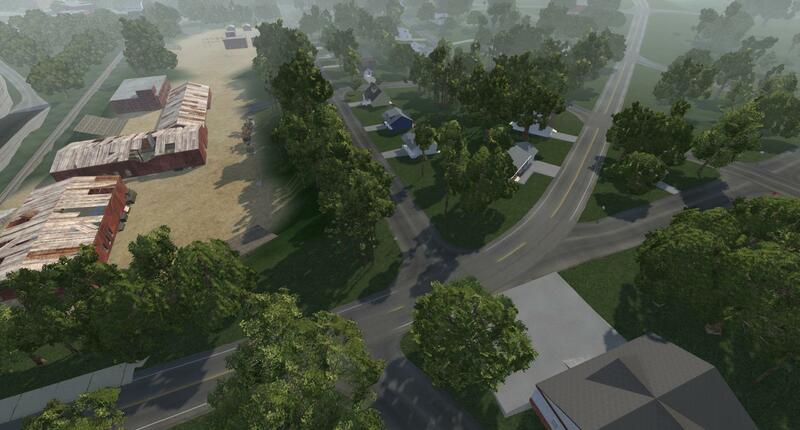 Los Injurus City Map's Patreon members will get this Roane County's update early, as in 1st half of this-coming week. The AI can now go to the bank, and use both lanes of the drive-thru. 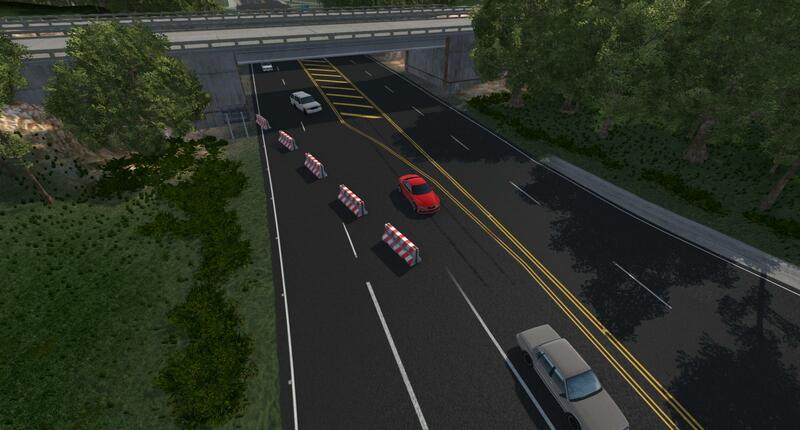 Also, Decatur Road AI disaster is fixed. 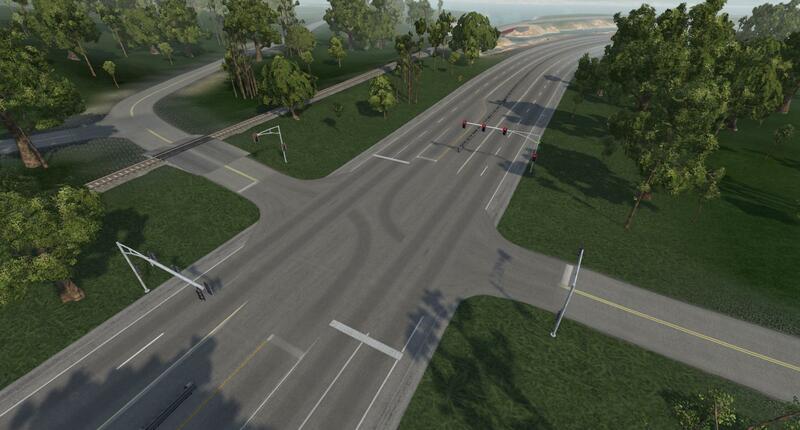 Also, this disaster of an intersection now has better AI. They can still cut through the strip mall and the gas station, though. Just two of the dozen paths or so are shown highlighted. Also, GREAT NEWS! The entire area within 1 or so miles of the SPEND A LOT spawn (give or take a half mile), including Pine Ridge Rd interchange, all left-turns etc, is all done with NEW AI, should work beautiful, though I will do some preliminary testing tonight. All the entire four-lane section from where it goes down to just 2 lanes (towards Rockwood where the pavement darkens/is newer), all the way in the OTHER direction to Kingston (and the intersection above, you'd come out on the top-left), is ALL done up nice. That's a lot of work but it's worth it last-but-not-least because I LIKE PLAYING THIS MAP TOO! Not just building it. 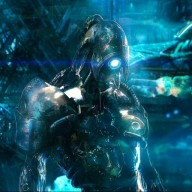 Tomorrow I will re-do stuff by Harriman and see if I can quench the AI's hunger for more iron in it's diet (eating stop-signs is NOT a good source of daily vitamins and minerals, it is a good source of Tetnis though). Don't forget DAYLIGHT SAVINGS TIME! It should be some time right about 2~3 hours ago. Don't forget to move clocks ahead (I am in central USA time here). 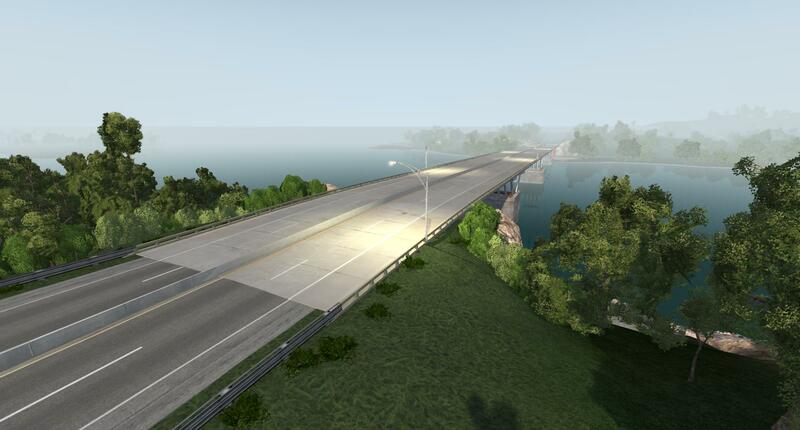 Yes, this is how you make traffic go over bridges without scripting AI way-points into the map.json file. 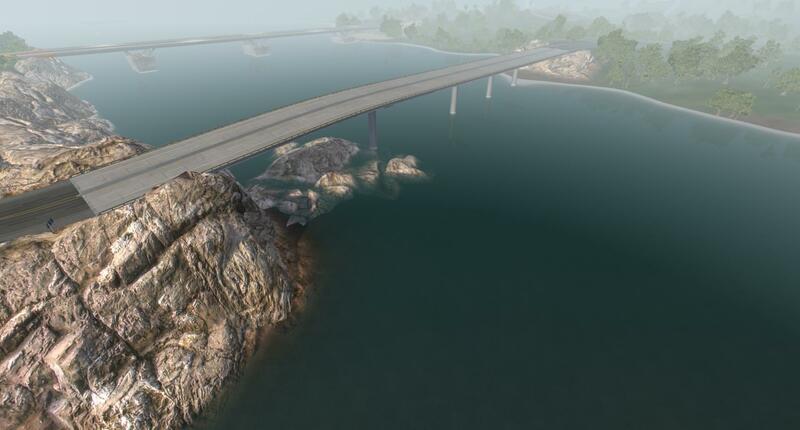 The two big bridges separating Kingston from the rest of the map are done now, this took a few hours, but it's top-notch quality (except for low-fi giant rocks) and everything seems to work as-intended. I will eventually address the rocks in a future version, but it does give the map it's own character, and in prior game versions it cut down on the amount of (FPS eating) trees needed. Will make sure the AI works well tonight. 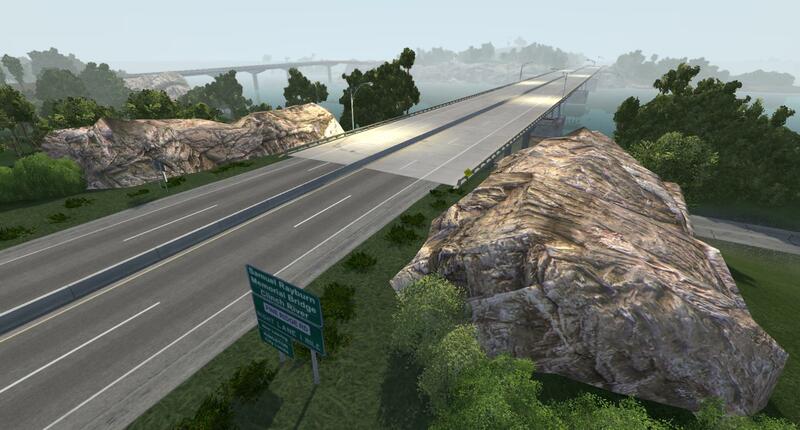 Will do the AI 'stuff' I need done in Harriman, and the rest of the bridges tomorrow and into Tuesday if I need to. Might get a bit more done tonight, not 100%. At-least I got my garage swept up tonight and yard equipment fired up and ready - it was in the 60's today - WOOHOO - I almost feel at-least 50% alive again. It's look like the beta will be out around Mid-Week for private beta testing, then hit public servers on or after the weekend. --That is all for right now. Turn the mini-map off in the HUD, use the one inside the vehicle (the on-dash GPS unit), if I use my mini-map, things get wacky or slow/laggy with the UI. This map is so large & complex with lots of very long or very wide roads, the mini-map script lags out. 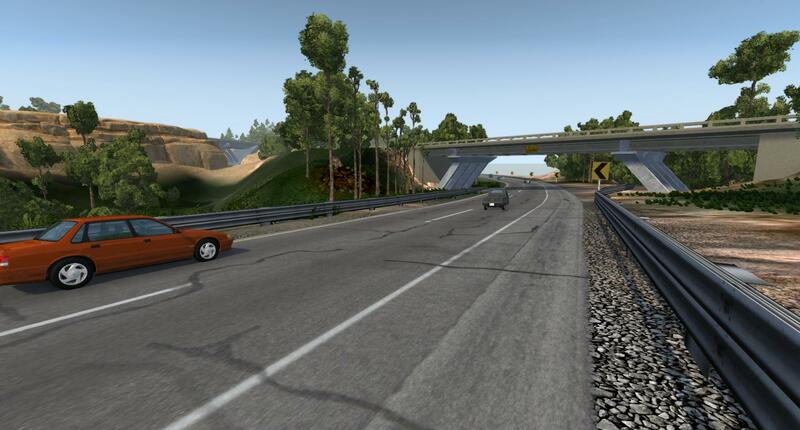 It will sometimes work better toward the edges of the map where most of the smaller roads are. EDIT: As per the water block in Roane County *LAUNCHING* cars depending on how you hit it, YES I will fix that. Oops. Guess the devs changed the water defaults twice now. OK, settled on a good value for the water, it's now 83% it's former viscosity and 60% or so of it's former density. This is in-tune with my observations from real-life. Slowly but surely - Harriman's AI is 90% done. Every last road in that town is getting done (not the ones outside the town, they'll still have regular grand-fathered-in AI, which mostly always is fine outside of town). The two bridges above have been replaced. I have to put pillars under the left one. 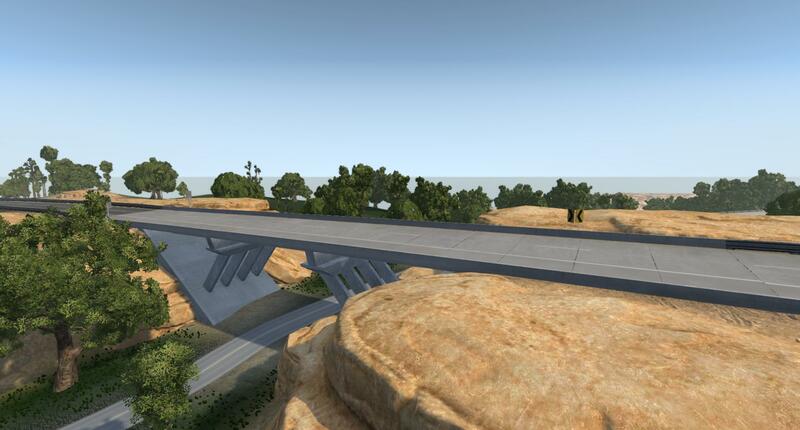 These are also bridges that have 'trickled-down' from the Patreon-funded 'Los Injurus City Map' project. Don't hit the ends of these bridge rails. I will see to getting something in to put on the ends so they don't stick cars. I think I have a Jersey-barrier end piece with a slope on it from WC USA's City. 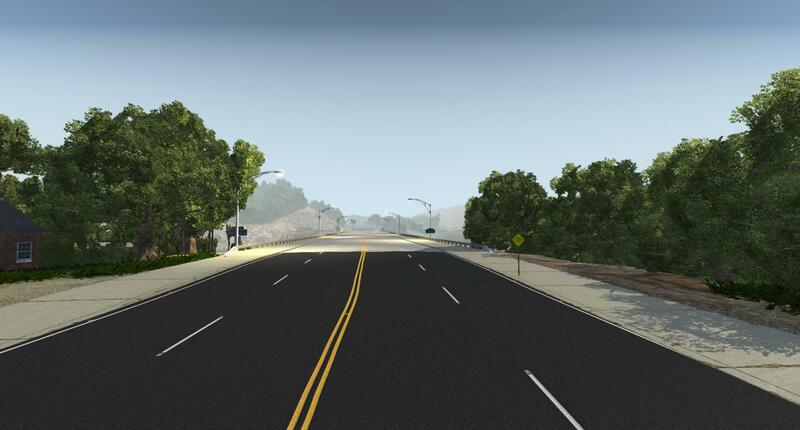 *ALL OF THE SIDE STREETS IN HARRIMAN (except for one or two I'm about to do) HAVE UPDATED AI* So now the AI should no longer act like it has an iron deficiency and chow down on every stop sign or other sign-post it finds. It was literally hitting every last sign. Even the speed limit sign next to the spawn. I started traffic and hit *home* key to go back to the spawn, and it all you heard was *crash* *smash* *crunch* *whack* as they found any sign they could find and slammed into every... last... one. So yeah that got fixed now, I will have testing to show this later. I have to re-do the AI south of Rockwood (it's bad it drives completely off the road there), and do one of the side-roads on the other side of the tracks from the main route through Rockwood (runs parallel to the main road there. Can't promise it won't eat signs out in Rockwood or Kingston but those towns are much less complete than Harriman. Haven't toyed with the draw distance yet. Don't want to kill the FPS for those people using 8 vehicles. I will post a tutorial later-on after it's released OR provide a patch file for folks to apply to the zip themselves, for those with monster systems and 1080Ti's (not me!). Will be re-doing a few routes where the nodes are too far apart. Don't want to change the actual roads themselves, as we're not 4k-object-limit subject anymore (it's been removed! ), if you move nodes around, they jump around a bit & end up in the grass and that just looks bad. There's probably enough of THAT to go around already. (I have grass DISABLED on my end because I run a Radeon card here, and they're glitchy with grass, this won't affect you folks that download this though, the grass will be there like always). The bridge shot above was where cars were getting stuck on the north (right-side) ends of the bridges in the north-bound lanes. That should be all fixed-up now. 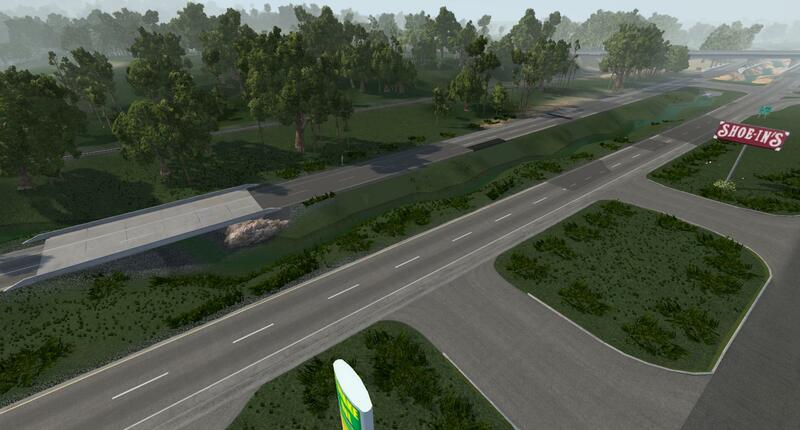 The AI on the main route of Kingston is all done now. That should be a lot better. Added AI for a bunch of lots there, and another bank. Fixed a bunch of the flickering in the Worst Buy lot and some of the strip malls there, there should be NO more flicker there. It was due to an issue with layering non-transparent textures. It used to work. 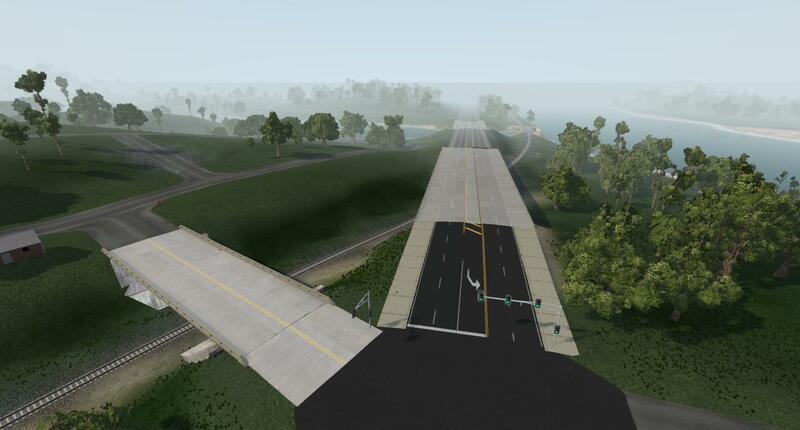 Kingston Interchange with US 40 (Kentucky St, right by the east-edge of the map / East end US40 spawn point) is all done now too. Using the US40 east end or west end spawns you can fire the AI tool right up with a dozen or so cars before you run out of spawn room since it's fairly level. AI going north on Kentucky Street under the US40 overpass (Kentucky Street, as you'd go to get on west-bound US40) will no longer SLAM into the construction barricades, or use the section of road past where the ramps meet the road on the north side of the interchange/overpass - they will enter the west-bound ramp by default. This should help map-flow and was a bit of priority change with the traffic tool. They will no longer use the road past the intersection with barricades/ramps as there's nothing past there but a map-edge. 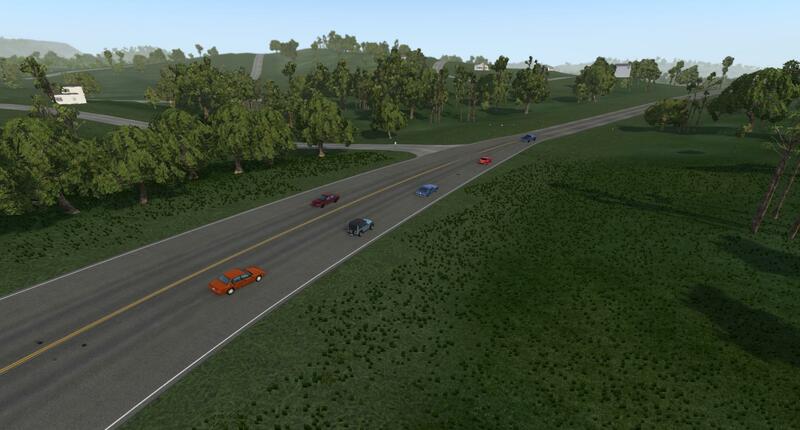 The AI south of Rockwood on the 4-lane is fixed up, as is Delozier road (north of Rockwood half way to US 40). Also, another mile to two miles of roadway at the east end of Delozier was done with new AI as it's node were too far apart. Added 4 insignificant stop signs near the church in Rockwood ('Grace Place' as the locals call it). 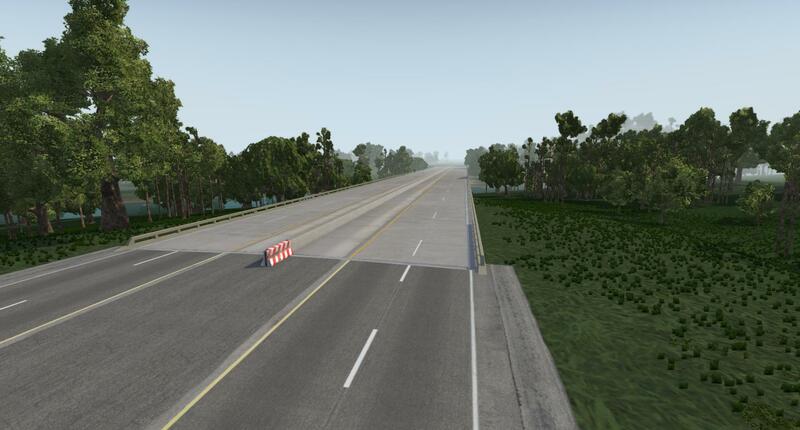 Still have to fix the road chunks so they match the highway textures. 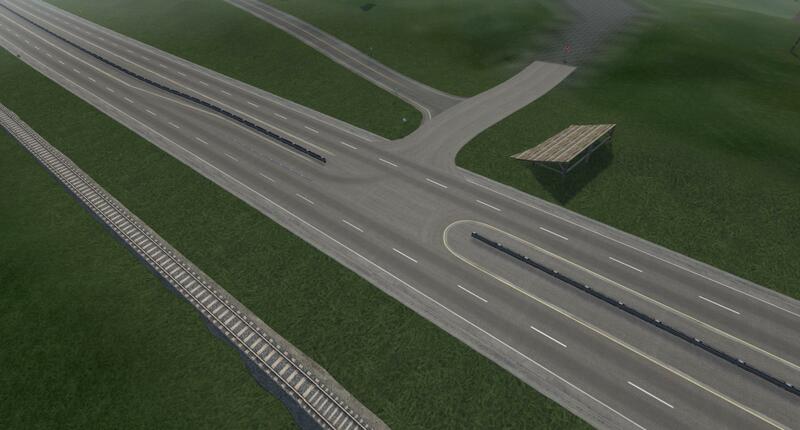 Still have to fix AI on on/off ramps on 2 of the (west-most) interchanges where I haven't updated it yet. These next things are non-obligatory goals that aren't worth keeping everyone waiting over. Still have a few random rural bridges to replace, don't know if I'll get to those or not, as they're not heavily traveled. At most there's four of them. There's a broken traffic light in-front of Sprawl-Mart, not sure if that will get fixed in time, will do my best. 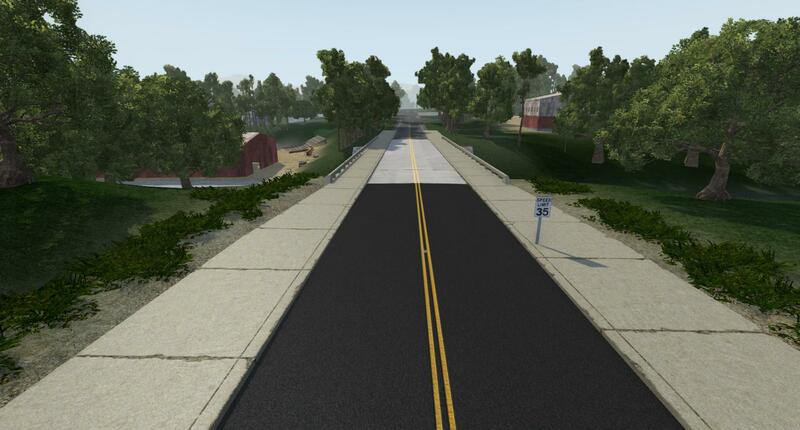 Edit: Harriman is completely updated with new AI, and the two last bridges in the town are replaced, also dressed-up a LOT of intersections around the north end and downtown. Not too many things left to do. Tomorrow is testing day if I don't have enough time tonight. I might be able to get everything wrapped up tonight, who knows. At this point, looks like Wednesday is looking like the day the folks on Patreon will all get a message via that system of the Roane County update. 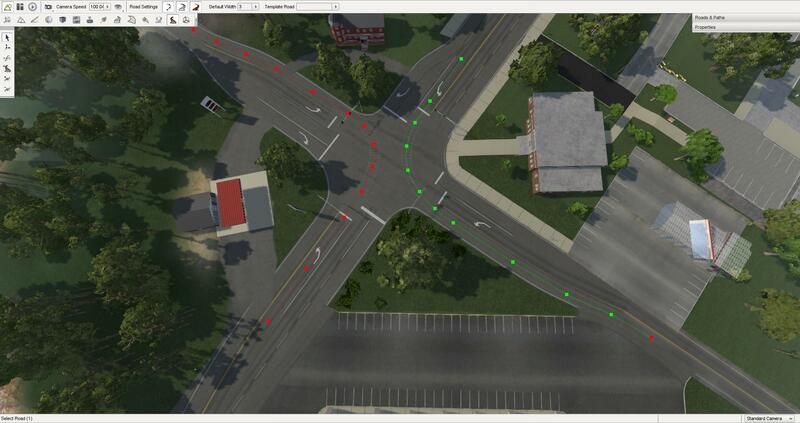 Lastly, added a shot of some of the AI routing in downtown Harriman. It'll use both lanes now with the traffic tool. It should go the correct way, most all the time, wherever that means, in-town. Still working on this. I've got maybe another hour left in me. Enough time for a new bridge or two..or three. MOAR! I have officially spent about 13~15 hours last-minute-cramming all the stuff I needed to do in the map into one day. The Bob is very tired now... but it's 99% done, it's just got to be tested / QC'ed and given a good test for a few hours before I bother spending half a day editing it. All bridges I wanted to replace have been replaced (7~8 since last post). Not including railroad bridges. Not including the two bridges right in downtown Rockwood because I have to make custom stuff for those two. 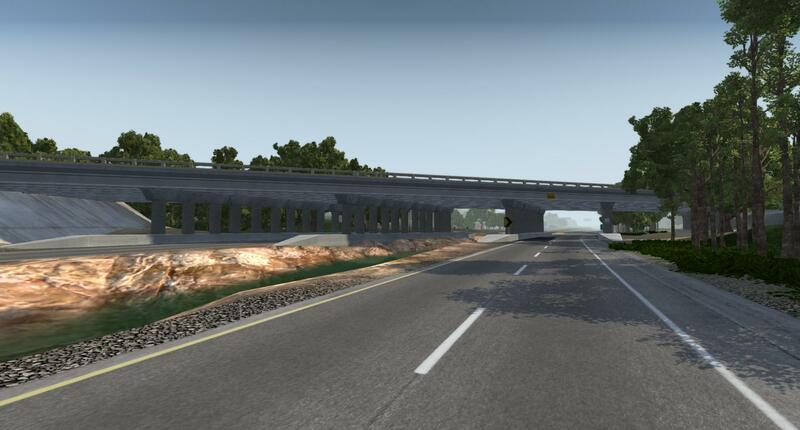 The 'GREEN BRIDGE' on the south-east of Harriman hasn't been replaced, it also needs a custom bridge made for it. I will do that one on the next update. Made a custom new bridge for downtown Harriman on the south-end of town (last two pictures). You won't hit the sign post for Dollar Miserable anymore when trying to hit the rock jump in the last pic, either. 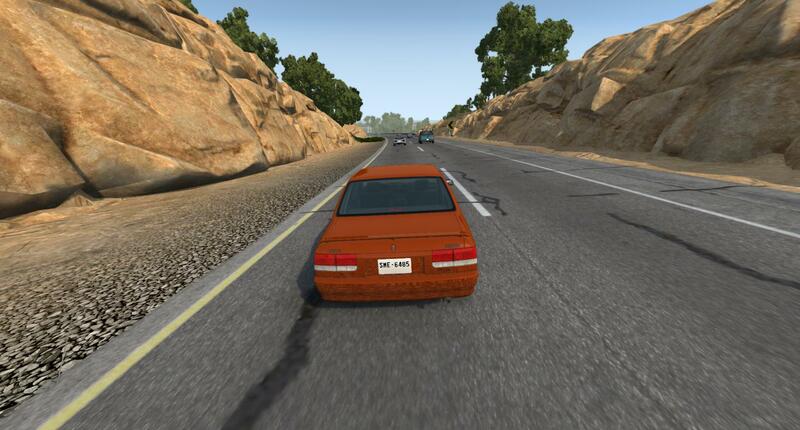 Road patch textures were intentionally made darker than matching, so it looks like a road patch. It's intentional (fourth picture). 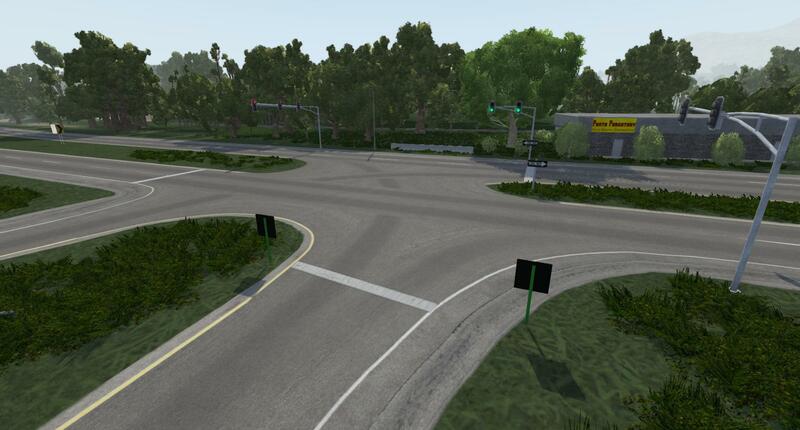 5Th picture is the new traffic light, and the road on the far side of the intersection that goes to pasta purgatory was intentionally removed from that intersection (it does not exist in real-life). Finished all on/off ramp AI paths. These should be much better now and the AI shouldn't hit signs or drive down the road-shoulder. The AI should NEVER drive down the shoulder in this new update, let me know if it does it consistently in some spot(s), also let me know if the AI goes the wrong way anywhere except very rarely on bridges (that can't be helped). 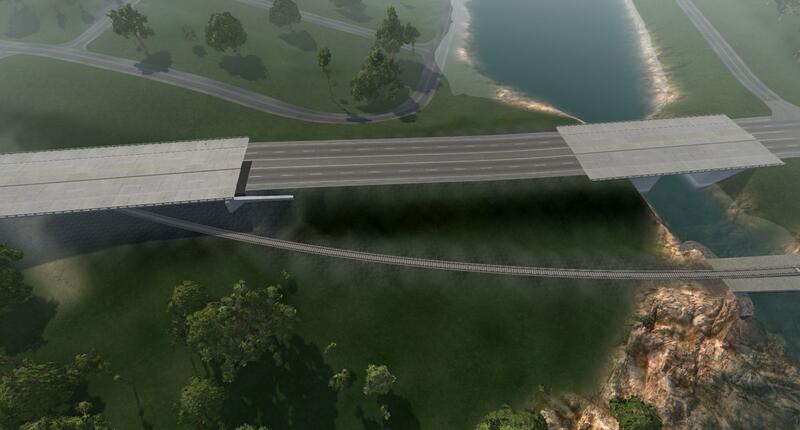 OK so I will be testing the heck out of this tomorrow and replacing the last bridge that hasn't been replaced yet (10~15 minutes of work with that bridge), that still needs to. 16 hours of mapping in one day doesn't make The Bob very happy, but it will be worth it when you get it. The quality difference and bug-amount should be easily recognized by most folks who frequently play the map. I got lucky with my back today. I will count my lucky stars on that one. Will upload this after I do some more testing tomorrow (technically later today!). Excellent work - can't wait to tear my way up and down the US40 and all over, with TRAFFIC! Well right now I'm debugging a bit, and going to remove some out-of-the-way roads from AI behavior, because I've hit the 65536 limit of AI nodes allowed - and now the AI is completely chunked. Traffic tool or not, it went BUST. It's always something. I will figure it out. IF AI is missing on some back-road, no one's going to mind. If it's missing in the whole map, that's a downer. Regardless, if I cannot fix it, release will still happen, it may delay a day, but that's all I'm willing to delay. They will have to fix the limitation in the game's vehicle brain lua file. It's the game itself that's bombing out with a soft-error (not crash to desktop). I will remove AI from older roads, or remove old roads altogether if I must, to make it work. Fixed, this thing is now working again with traffic. Indeedy there were just TOO MANY AI NODES. Sheesh, game's not even out yet and I've out-done the limits again. Stuff by the power plant itself - none of the major routes. Stuff out north of the Airport, where there was literally absolutely nothing. The main route (Airport road itself) still has AI function. Only alternate side-routes out there were disabled. Dead-end rural roads / rural roads that meet no other road that lead only to the map edge were removed from AI use to save on nodes. You won't be missing anything really. The roads are still there - but the AI won't appear on the dead-end ones. 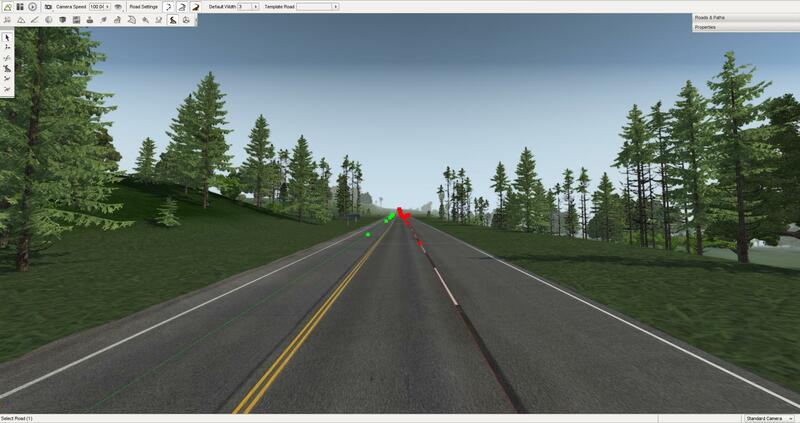 AI use may go up to 1000ft (360m) past the last intersection or cross-road to simulate AI traffic, but that's it. Best to use 1.3x the spawn distance (spawn rate I believe is the value on the box), especially if you're on the highway. Will commence uploading within a few hours if nothing else comes up. This is Roane County 0.15.x to match game version. There's a limit for AI nodes? Dang, I had no idea, and I'm quite impressed that you hit it. The cutbacks sound worth it; I just wanna zip through traffic all day on the interstate. More traffic testing is on my agenda; I gotta fix that lane bug as well as a few other bugs that I chose to ignore for a little while. Looking forward to playing your update! 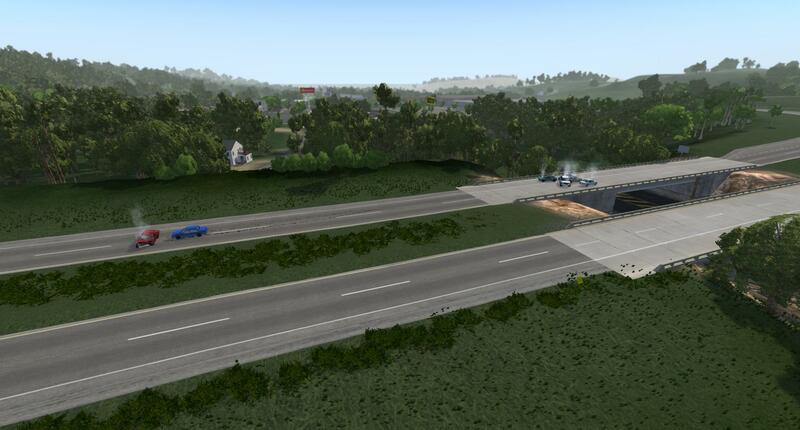 Well, AI is working well, have a bit of touching-up to do on on/off ramps, but other than that, it's pretty decent. It even goes over several jumps in Harriman Downtown area (well, it TRIES to go over jumps, that is). Yes, there's a limit, I am within 100 nodes of that limit currently, but it does function fully the way it is. I am sure not to cut out any major 'loops' in the map, everything that matters still has it. I will inquire with the developers about it, to see if they can filter the non-AI functioning nodes from the AI nodes instead of looking at the whole heap, before it hands the value off to the AI engine to index (That would cut it in half or at-least knock a good third off). So Gull it's not your bug at all, I checked, and it does it without the traffic tool, it's only pulling a 16-bit value (max 65536 nodes), which is half the math to process, but still - quite limited obviously. In other news, AI will also attempt these jumps, too. 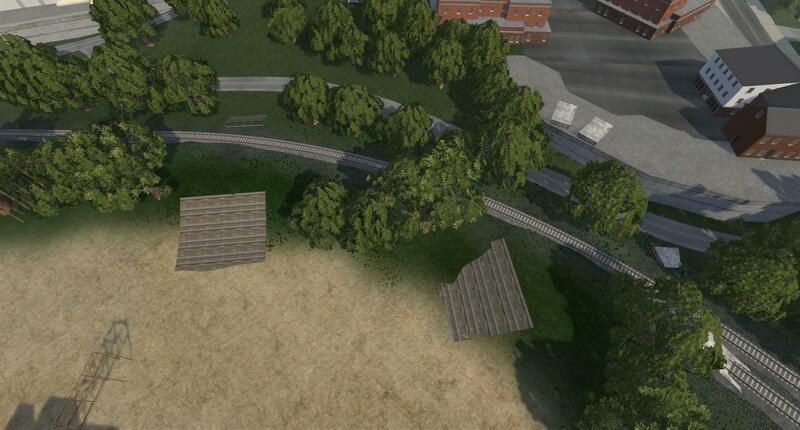 The two opposing pairs that cross the rail tracks may be attempted by AI, the pair sitting on top the wall in the top-right won't be noticed by AI though. 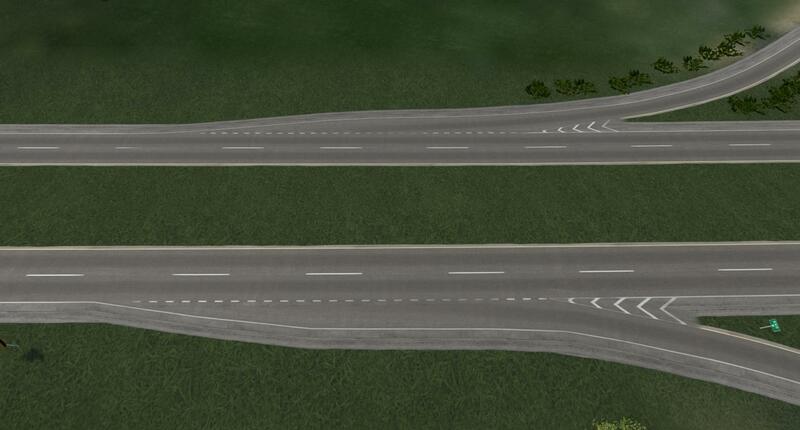 They might be able to make these two pair, though, unlike the other one I showed above (unless you max out the speed limits). Now the AI is working on on-ramps fine. Never-mind, I replaced it since I couldn't figure out why the animation didn't work. For those of you in the USA, sometime before NOON there should be a msg via PATREON (for those supporting the Los Injurus City map), with a download link via Mega. For those folk other than the above, you should be able to download this by Monday (it gets a few days of testing, in-case I buggered anything good). The fact that you have placed over 65000 points is incredibly impressive in itself! Thanks - it's surely very impressive until you realize at 66,000 points or so (give or take 50~100 points), that you've completely broken the AI until you remove a few much-less-used roads. Who would have thought that the AI brain is only using 16-bit values - unless there's a SNES or Genesis / Mega Drive port of BeamNG I don't know about? Thankfully, this map already has a majority of it's road networks in. There's a few roads out in the middle of no-where I can add when need-be but that won't be until the city map project - Los Injurus City Map - is much further along. I will be getting back on that in a few days. The Los Injurus City Map has it's own thread, in the forums section. If you search for it, you will surely find it. A Patreon-sourced message went out with the map link today around 1100 to 1200 hours CST (USA Central time, about noon for you civvies in the bunch). The message contained the description, summarized change-log, and a link to the 1.2GB (EEK) Roane County map file. 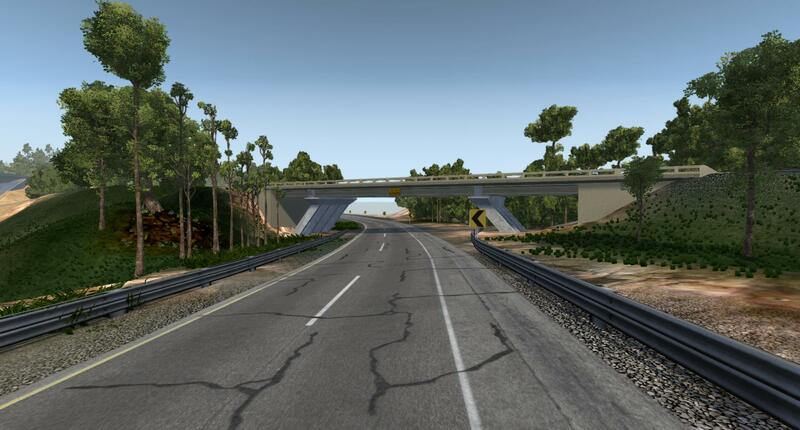 For those in-the-know about my other maps, Tail of the Dragon / Deal's Gap, and Nevada Interstate - both these maps are working again due to a recent bug-fix two to three weeks ago. So go ahead and try them even if they say unsupported. I will have them changed back within a few days. Deal's gap should work great with AI as it has LOTS of nodes. This thread might go a bit dormant for a while (unless someone messages in). Forum-hosted version will go live sometime around MONDAY for the general public, provided I didn't butcher anything. Only errata is that on a few of the on/off ramps, the AI isn't totally centered in the lane, and the railing texture on one of the houses sourced from Garfield Heights isn't 100% perfect, shouldn't really be noticeable unless you stare right at it while stopped. Nothing that's a deal-breaker. --That is all for now. Sometime on or immediately following the weekend, when I am sure no more bug reports will come in (none have yet) from this, I will get back to doing things for Los Injurus city map, since the other maps I planned on updating are currently fully functional. 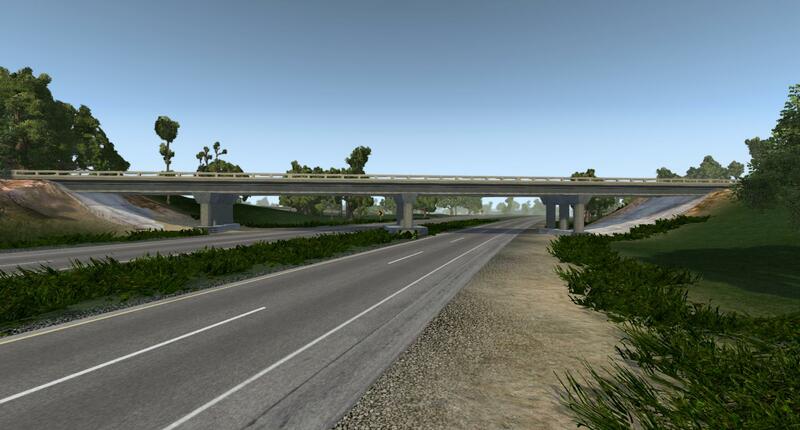 Nevada Interstate may get updated later this spring for use with the traffic tool. It's a non-obligatory update, however. AI going the wrong way on the road BEHIND the sprawl-mart (not immediately behind it, it's like a quarter-mile behind it, the 5-lane portion had it's nodes spaced too far apart, traffic tool doesn't handle this well yet). I fixed a missing 'one way road' setting where it goes from two to four lanes here just now, too. Cars were heading the wrong way down this road often, not good, and also to the section to the bottom-left of the shot as you drove up to it from Kingston or Spend-a-Lot. 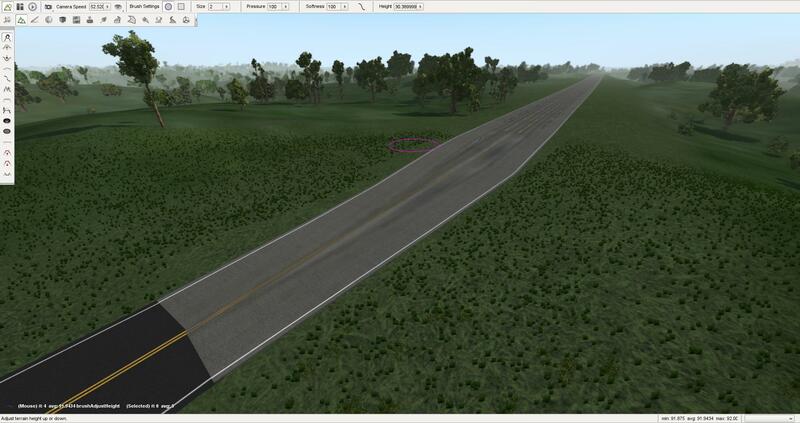 There was also a section of dropped roadway on the side where the purple circle (cursor) is, very minor but fixed now. AI not holding lane on the last half-mile or so of Route 27. This is where the jumps are if you take the main route out of Rockwood and keep going with it until you reach the jumps and then the map edge. AI brake-checking when getting on or off the ramps at Westel Rd and Airport Rd (the western-most two interchanges of US 40 highway). This was due to AI nodes too narrow for the ramps. Narrow=slower, I did so to keep it in lane here, but now it shouldn't be a problem. Also would rarely happen on the interchange of US 40 and the road to Rockwood/Harriman (Roane St / US 27), so I fixed that too. If there's any other bugs out there, let me know today or tomorrow at the latest. Tomorrow's bug reports might not make it into this version's upload, but do send anyways. I will be uploading a new version tonight. 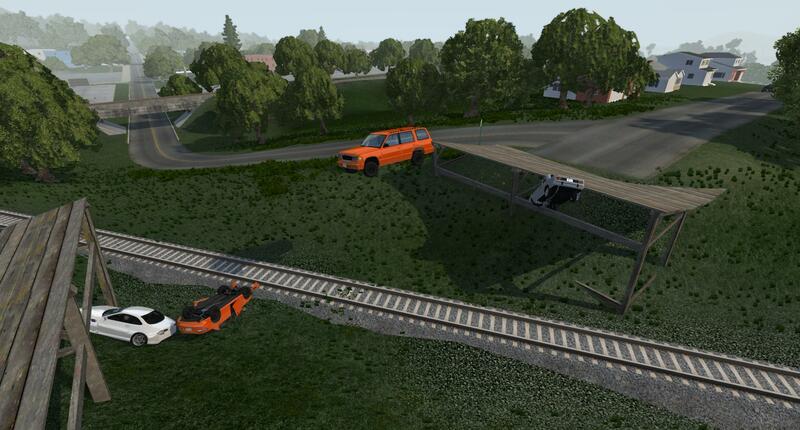 This will be the release version for the BeamNG forums here. I will have a link via Patreon also, for those interested, they can get it a bit earlier as the new one won't be up until Monday. There's very little difference, just a few small changes to the AI, so unless it was bothering you in a spot regarding one of the above-bugs, you won't have to re-download it unless you want choose to. OOPS, AI still rammed the barricade under the bridge in Kingston, at the Kentucky St overpass under US40. The barricades to the north-side of the bridge that push traffic into the left-turn lane got moved back a bit this time. That should fix it. Turns out that was caused by old AI routes still in use that should have been deleted, that weren't. This frees up another 80 nodes or so now. 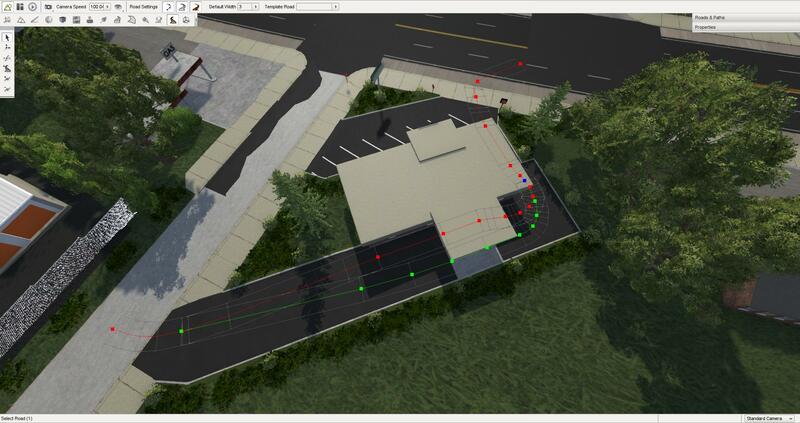 Now the traffic will properly use the on/off ramps at Kingston Kentucky St.
Added another node on each side of each bridge for AI routing described above with the barricade incident... this way cars shouldn't go the wrong way in two spots. Fixed some of the grass-in-the-road here too. Still making last minute amendments to the map. Lest I forget something and then have to spend 5~7 hours uploading the stupid thing again. Got lots of testing done yesterday, saw lots of stupid AI but again much less than previously (actually it's a LOT better now). Most of it is resultant of checks for changing lane settings NOT getting done (four lane divided roads going to two lane bidirectional, going from two-lanes one way such as divided roadways and turning into the left ONCOMING lane of a bidirectional route and so-forth). This isn't something I can change - that has to be done by the traffic tool. This also can sometimes happen less-impacting though on an on-ramp or off-ramp, it can sometimes cause the traffic to go to either side of the single-lane (driving over the edge of the lane by two feet or so, about a half meter), running over curbs or into signs. Again, that's traffic tool department there - I can't fix that (except where there were phantom AI lanes that shouldn't have existed - hopefully got those all out by now). Trying to make this finished-product release as good as possible (technically it's still WiP but I want to get it polished up nice so I don't have to fix it again right away). Will get it uploaded sometime today so do check by tomorrow morning or noon-time (USA time) that there is or isn't an email via Patreon with a totally optional non-obligatory new link. Non-obligatory as I stated because if nothing has seemed amiss in your version, nothing would even be noticed! 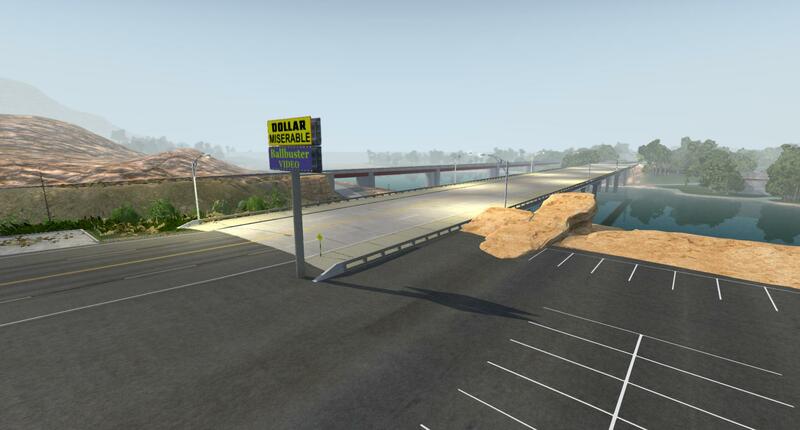 AI acting up on on/off ramps and running over the curb in-front of Worst Buy - the some of it which was caused by an old AI route still there on a few of the ramps is fixed, some of this is a bug in the Traffic Tool. Some of the above can be caused by the traffic tool not checking for changing lane conditions being present, sending it into the wrong lane / going wrong way / not maintaining lane properly - bug already submitted. Added some more nodes to the Kentucky St overpass on US40 to stop wrong-way drivers from appearing. I would hope this doesn't happen anymore here @ Kentucky St. US40 Overpass. Tests OK now. 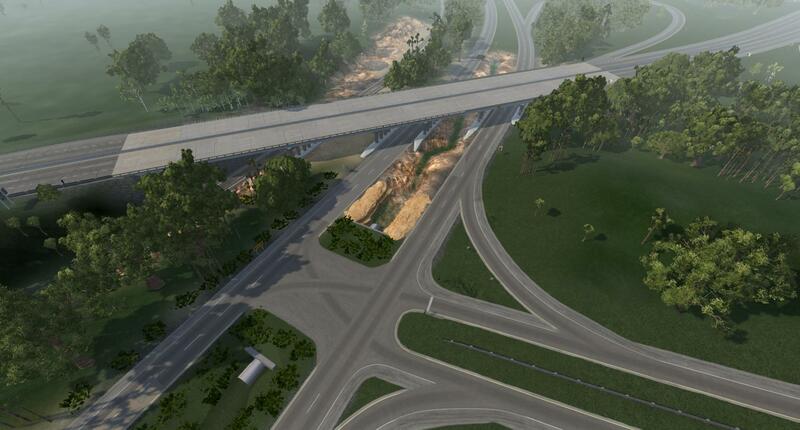 Added some more nodes to Ruratin Rd overpass to lessen chance of AI going wrong way here, too. 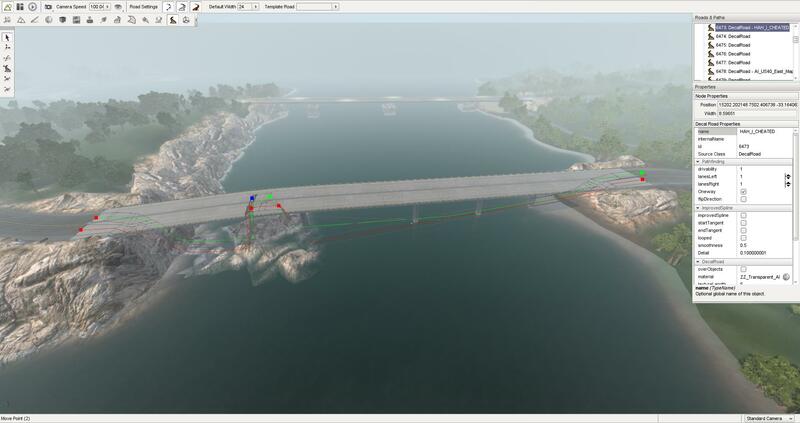 Adjusted nodes on Pine Ridge Rd so that the gap is not so long over the bridge (for the AI again same as above). EDIT: OOPS! Grass/mud in the road @ Thomas J Pickel JR bridge (west of Kingston), fixed. AI traffic nodes were really really messed up between here and the bridge (out of shot left-side). Tests OK.
That two picture section above of roadway was actually one of the most tricky ones to fix. "Sleeving" the joint with a second AI path going for 2 nodes each way from the joint, actually fixed it (it did for other before, too). What makes these tough is if you overlap the two separate sides at all on the multi-lane side, it ends up with them auto-joining as intersection can/do, when they shouldn't, in weird ways, and you end up with a giant pretzel of AI routes that confounds AI easily and is very hard / time-consuming to fix. Fixed road-blending under the US40 bridge (well next to it on the north side) on the road that goes to the Kingston fossil power plant. It was entirely missing any road-blending on two of the three intersections on that road 'triangle'. Removed some AI roads that weren't needed (intersection pieces had AI use; they shouldn't, as it causes them to eat stop signs). Re-enabled a missing AI route on the route to Harriman from the fossil power plant. You can now have the AI going from the Power Plant to Harriman and back on that loop as a portion is no longer deliberately removed from AI use. 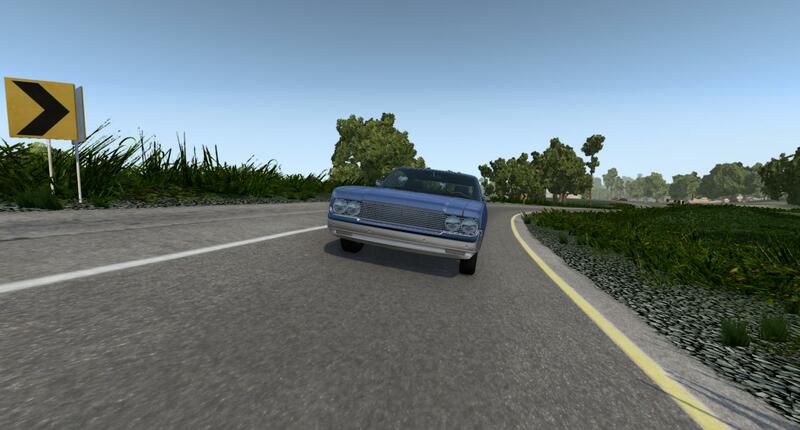 Fixed brake-checking on the hill-crest on the two-lane portion of road immediately next to where the AI was driving the wrong-way behind SPRAWL-MART (it went the wrong way on the four-lane portion), and a brake-check condition near where I enabled the AI route above. 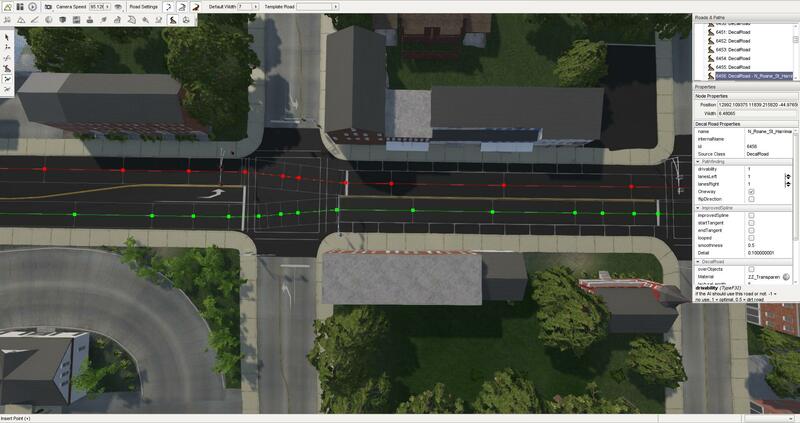 AI may still be dodgy on the SMALL bridge with the high center (and green beams) going into the SE section of downtown Harriman but it SHOULD make it across. That's one of the few remaining old-style mesh-road bridges, but I don't have a new 'bend/arched' piece for the smaller bridges yet and that will take some time to make. AI brake checking immediately after, or before on/off-ramps & between intersections for ramps under Roane St Underpass on Route 27/40 interchange, southbound only (this change amended). 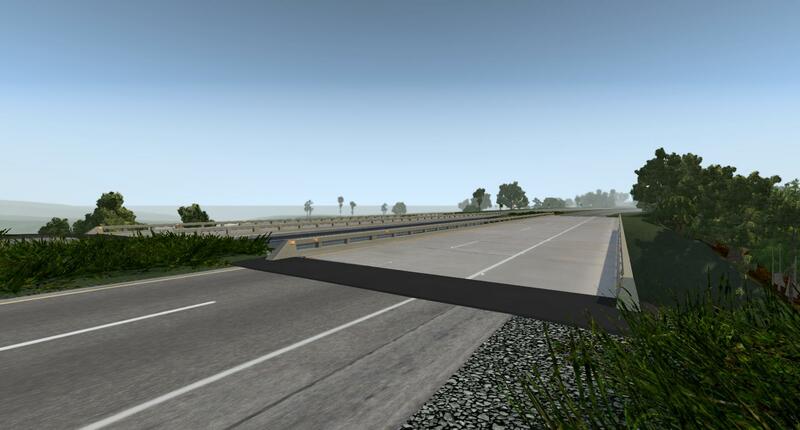 Bug reported and fixed: Road pictured on above post had several things wrong with it. Took 3 attempts to fix but IT'S FINALLY FIXED. There were several things wrong here & I really hope it's fixed now, tested OK.
Bug noted by me and embarrasingly fixed immediately: Barricade-seeking vehicles (noted above, this took 2 times to fix after I thought I fixed it before release). Crash, Crunch, Smash bash crash... Yes and the barricades are moved back just a bit too so now there's NO WAY this can happen. It better not. This is finally considered fixed. Sheesh. This hopefully should make the REPO by Monday-Tuesday or such. I even used "T-rex-temper-tantrum stomping on meeces level of compression" and it still took forever to be done (but it was 8.x MB smaller *grins with halo*). Link will likely go out within an hour for those on Patreon. I will send the site admins a copy too. The admins can decide to put it up whenever they want to (after-all, like everyone else I am at the mercy of them, I'm no better than anyone else). Hopefully they don't start charging me hosting, because their bandwidth is going to go through the roof when the 2nd most popular map gets downloaded like crazy and it's 1.25GB. Nothing I can do about that - I am sure I can go through and knock out 50~75MB of assets that aren't used any longer but the chance is great that someone's going to get a nice greeting from the orange 'no texture' committee - and we wouldn't want that. Legendary Quality Hint: Don't make asset changes to the map just before shipping it out - this leads to lots of OOPS! work later. I've already learned this lesson a long time ago. If the moderators put this up during the weekend, consider that good-graces & absolute sheer luck, but I doubt they're in on the weekend. If not, surely by Monday-Tuesday something will be online as stated before. For the next release I will work on rooting out some of the older assets that have been outmoded or otherwise "who's services are no-longer-needed", maybe can get file-size down a bit. It's a monster-sized map though so actually 1.2GB is small if anything. It's hard to make such a huge map without using a lot of different textures, ergo everything will look too much the same. P.S. Look for Los Injurus City Map stuff coming next week! I will be happy to get back onto that map, the terrain is so much easier to work with. For anyone who has the 15.x or the brand-new 15.2.x version of this map and wants to use the traffic tool the way I do, please see the attached screenshot for optimal custom settings. It's found under traffic_tool_gull\ge\lua\extensions\freeroam in the zip for the traffic tool and the file is dynamictraffic.lua. This makes the traffic spawn in and out about the same range as GTA's traffic does. When the traffic tool has been updated (there's a bug-fix in the works), I will re-download it and send it back to @Gamergull with my values, to use specifically for this mod & the city map. 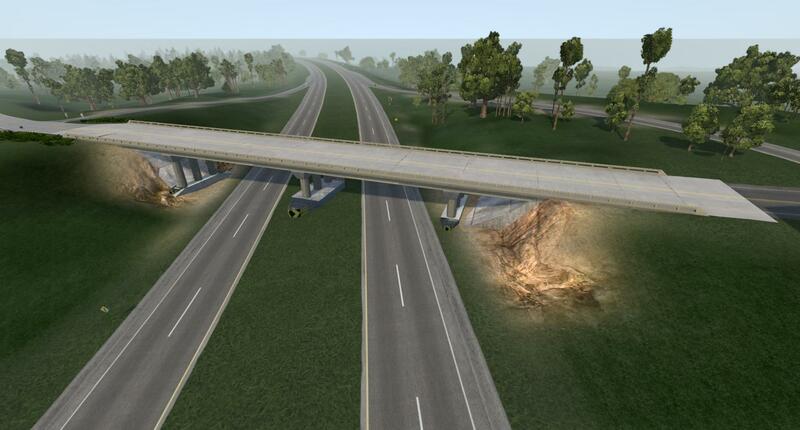 Having higher spawn-out and spawn-in values prevents stopped-vehicle incidents from happening on the high-speed motorways found all over this (and Los Injurus City map) from happening as much, as vehicles will have longer to get up to speed. I mean if you like stop and go traffic that's fine, but that's not always what everyone is after. My values are roughly fifty-percent higher to double of the 'stock' values. I also use 95MPH speed limit or so, but you can keep it to 70~75mph as that's about what people do on the highways (and 70 is the speed limit) - that's up to you folks. My well-aged 4790k 4.4ghz (all core, chip delidded, multiplier locked at that speed through BIOS) machine with 32gb of low-latency 2400mhz DDR3 RAM and an RX 480 8gb card all were able to run 7~9 vehicles, at most. 7 or 8 vehicles were the best experience. I'd say 7 vehicles for 4770k or 4790k / 6700k / 7700k owners, you can try 8 or 9 but very rarely it will begin to drop below 20fps if the cars are crashing often. Please don't add any custom pathways for AI for those who know how to use the F11 map editor, it's at the limit currently and you will cause the AI to break if you add much more than a city-block long roadway with it. One day I am going to have to think about building a new computer, one day, just not yet. With the traffic tool, I finally have a reason to use more cores with testing the AI (the more cores I can obtain, the better off this AI will function as I can test more efficiently, with more cars in-play at once). This machine is getting rather old at 4.5 years as-of next month... so yes, for reliability sake, I might need to think about replacing some things - If not now, then definitely by the fall. Heck, I've never even owned the same machine as my daily for more than 3 years in my entire life, and I've been computing 25 years now. It certainly won't come out of the city map's funds though, this will come from my own pocket - so no 9900K machines for me unless I win the lottery, it will be a Ryzen. I have also uploaded a LUA file if you would rather use this in-stead of editing the values manually. PLEASE ONLY USE THE LUA FILE WITH TRAFFIC TOOL v 1.1 THAT IS CURRENTLY AVAILABLE. USING IT ON THE 1.0 OR 1.1.1 VERSION (PENDING) WILL SURELY MESS IT UP GOOD. The lua file can be placed where I listed above on the first few lines of this post. This file won't stay and I will pull it when the next version of the traffic tool goes live, to be replaced by a custom mod of it, but I will leave the screenshot. I am sorry this has not appeared on the repository yet. There is nothing I can do about that, either. Folks will have to message the moderators about it, if they're interested in doing so. I am currently looking into hosting it (and eventually Los Injurus, also due to size) on MOD-DB to alleviate this issue.